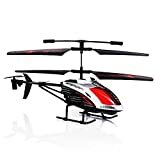 Remote control helicopters are one of the most popular types of RC vehicles. With a wide variety of models available for the young and the old, they truly are fun for the whole family. To help you choose the best quality remote control helicopter at just the best price, we have put together this RC helicopter buying guide with everything you need to know to easily choose the right one. 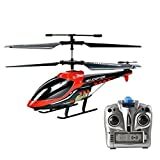 Electric RC Helicopters: Electric remote control helicopters offer easy repowering options - just change or recharge the battery - and are normally found in beginner and toy RC helicopter models. Additionally, battery power is more economical as well as quieter in operation. 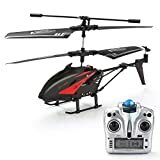 Gas RC Helicopters: Fuel powered remote control helicopters offer flyers many fewer height restrictions and have been known to hit heights of up to 1 mile. Saving the hassle of charging, these helicopters are great for the enthusiastic hobbyist. 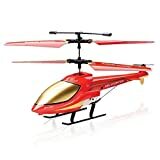 Toy RC Helicopters: These remote control helicopters are both easy to operate and easy on the pocket. Their lightweight builds, easy though limited controls, and more affordable prices make them well suited for beginner pilots and children. 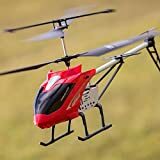 Single Rotor RC Helicopters: Perfect for beginner hobbyists, these remote control helicopters offer a stable flight. 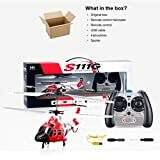 Offering more of a challenge than toy helicopters, they are great for testing your interest or as a beginner vehicle while learning . 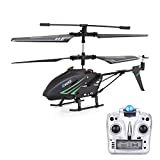 Single Rotor Hobby RC Helicopters: Offering a lot more control, these single rotor remote control helicopters come in a variety of designs. Best suited for more experienced flyers, these are a great upgrade or addition to your collection of RC vehicles. 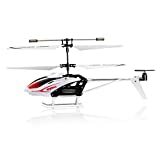 Micro Coaxial Hobby RC Helicopter: These professional remote control helicopters offer flyers the most options. Larger in size, they are more adaptable and upgradable and their dual or twin motors allow for a lot more movement. 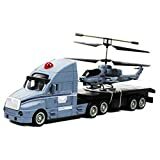 Build: Crashes happen, and remote control helicopters that can withstand bumps without too much damage are rated much higher by their owners. Reinforced plastic machines, which offer durability without compromising on ideal flying weights, are top online performers. Flight Stability: Remote control helicopters that can withstand outdoor flights with wind are reviewed much higher than those that can’t. This is a particular concern for beginners who prefer to forgo responsive helos for stability flyers. Channels: The more channels a remote control helicopter has, the more flying options it has and the better the reviews are, especially by intermediate RC helicopter hobbyists. Choosing the amount of channels for your skill level and the amount of options you want will ensure equal satisfaction. 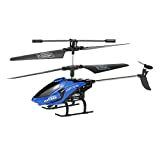 Flight Times: The average flying time appreciated by online reviewers is 5 minutes for beginner remote control helicopters. RC helicopters can enjoy up to 12 minutes of flight depending on the model, though, so checking manufacturer specs to asses flying times before purchasing will ensure greater product satisfaction. RC helicopters bodies are either built from plastic, aluminum, glass reinforced plastic, or carbon fibers, and have varying lightweight materials for the blades. For beginners, opt for a more durable model, such as reinforced plastic, that will allow for a few more bumps. For professional flyers, more lightweight machines will allow for more flying capabilities. Choosing channels: A remote control helicopter transmission channel refers to how many operational signals the vehicle can receive from the device. The most basic RC helicopters usually come with two channels, one to control turning and one to control the forward flying motion. Intermediate models will include the same two, plus one more channel for reversing. The more complex RC helicopters will include three or more channels offering more flying flexibility for serious hobbyists. Choose a remote control helicopter with lithium rechargeable batteries to enjoy longer flying times of up to 12 minutes. Choosing a top known brand with easy to find replacement parts is highly recommended for a longer lifespan as well as more adaptability. If you are looking for a RC vehicle that can hold a camera as well as fly, opt for a quadcopter instead. Meijiaxin: Specializing in RC vehicles, Meijiaxin Toys Co., LTD has over 10 years experience in radio controlled vehicle production and they manufacture top rated remote control helicopters. Syma: Syma Toys Industrial CO., LDT designs and manufactures quality renowned remote control helicopters that are exported globally. WLtoy: With years of experience producing RC products, WLtoy is a remote control helicopter expert known for their quality products. Hero RC: Founded in 2011, Hero RC is an American RC toy company specialising in higher-performance RC vehicle products.